In an attempt to overcome financial difficulties a prestigious New York City ballet company decides to put on a production of the always popular Swan Lake. 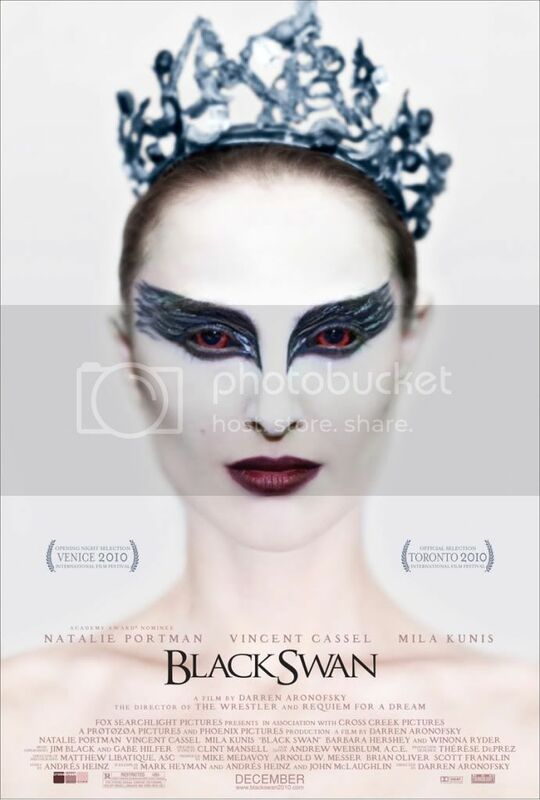 Nina (Natalie Portman) who is one of the company’s many talented ballerinas is given the part of both the white and black swan. Nina is a perfect fit for the role of the white swan as it reflects her innocent and fragile nature. But she struggles greatly with the role of the black swan, which is passionate and sensual. Upon taking on such a demanding role Nina becomes constantly haunted by disturbing visions and hallucinations while dealing with an over bearing mother, (Barbara Hershey) a rival dancer (Mila Kunis) competing for the same role and the immense pressure of desperately trying to please the production’s directors (Vincent Cassel) who is displease with her performance and is considering replacing. All of this combined pushes Nina to the very edge of insanity but at the same time she discovers a darker and sinister side to herself, enabling her to strive to the level of perfection she so very much longs for. I was impressed and amazed with this Black Swan, but it’s difficult to describe what it’s like. First of all it is very different to say the least. Director Darren Aronofsky delivers a nightmarish journey of a fragile tortured young woman being consumed by her role and is torn between what’s real and what isn’t. The way the film is shot is nothing short of brilliant. The imagery is at times dark and horrific but also breathtakingly beautiful. The plot is very intriguing from start to finish, the psychological element works so well. I enjoyed trying to figure out the hidden meanings behind many of the hallucinations experienced by Nina. It contains plenty thrills and shocks and has a very eerie feel about it. There are a few humorous moments that are deliberately thrown in to lighten the intensity of some scenes and it works. I did begin to get a little confused towards the end but that gave me something to think about after the movie had finished, which I soon figured out. Natalie Portman’s performance as Nina is one that I think that people will be talking about in years to come. She’s so convincing, the expressions on her face speak absolute volumes of the extent of her pain and daily torture. This role must have been so emotionally exhausting. I have no doubt that’s she’ll win the Oscar for Best Actress. Performances from the supporting cast are all excellent. Vincent Cassel who I really notice after seeing him in Eastern Promises was great; his character wasn’t the nicest person in the world but good to watch and has great presence. Barbara Hershey as Nina’s mother is I think best described as terrifying, in her character and physical appearance. Black Swan was a unique and memorable movie going experience. A movie that should been seen up on the big screen as I think it will unfortunately loose some of its dramatic effect on its transition to DVD and Blu-ray. The night I saw Black Swan my friend and I were the only two guys in the cinema along with an audience that consisted of young woman, old women and very old women, including my primary school teacher from grade 3. I wonder what she thought of it? Thanks, I'm glad you liked my review. You should really try and see at the cinema, as I said it's one that should be seen up on the big screen.